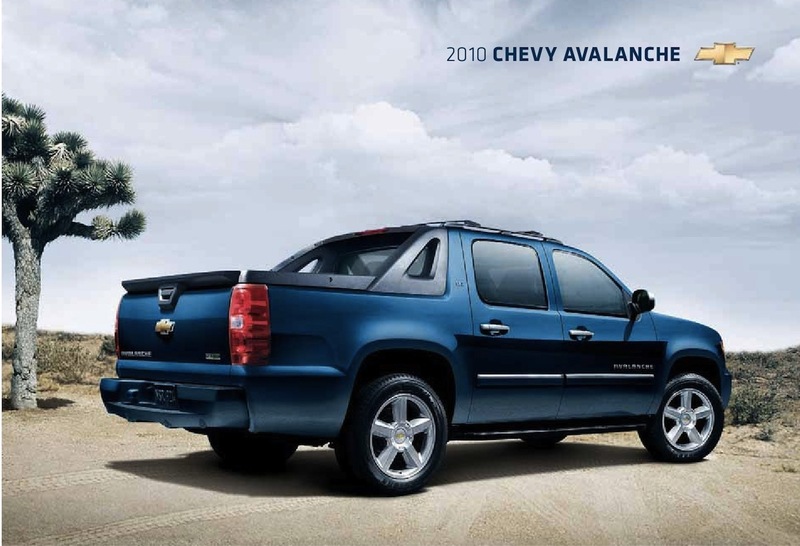 Sales brochure for the 2010 Avalanche Chevy Truck. Option packages include the LS, 1LT, 2LT and LTZ in both 2 wheel drive and 4 by 4. Three engine options are the 5.3L Flexfuel V8, 5.3L gasoline V8, and the 6.0L V8. Exterior colors are Blue Granite metallic, Imperial Blue metallic, Graystone metallic, Black, Inferno Orange metallic, Deep Ruby metallic, Victory Red, Gold Mist metallic, Silver Birch metallic, Summit White, and White Diamond tricoat.